Want an easy no bake treat to munch on this week? 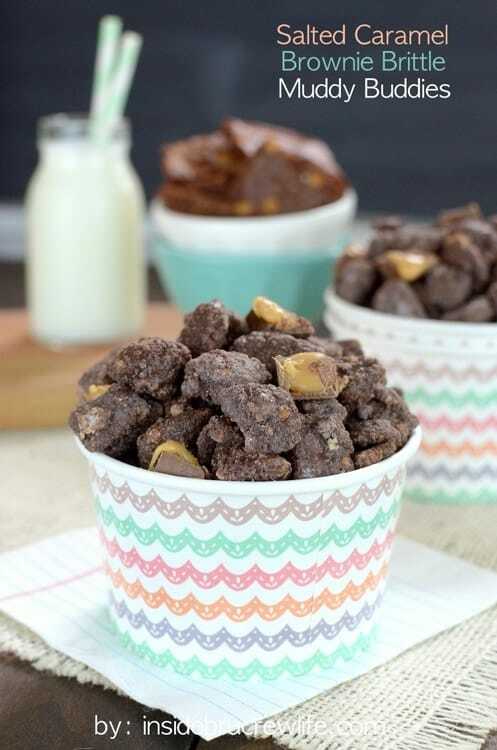 This Salted Caramel Brownie Brittle Muddy Buddies is perfect for school lunches, after school snacking, or that occasional midnight snacking fest. 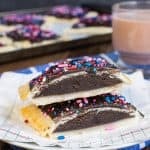 Today I am partnering with Brownie Brittle to bring you a delicious treat using the sweet snack. *Be sure to sign up for my email newsletter…you can enjoy these recipes in your inbox. Earlier this year I had a chance to try a sample of Brownie Brittle. Let’s just say that little bag of goodness did not last long enough in my hands. My kids were climbing all over me trying to get the last piece. Our family was definitely a fan from that very first bag. This past May I attended the BlogHer Food conference in May where one of the vendors was Brownie Brittle. I kept making my way around the vendor floor to snag more bags of the crispy brownie wafers. My logic was that I was making sure I had enough samples to take home for each of my children. I’m such a giver you know. In reality, it was for my own snacking pleasure because a few of those sample bags may have disappeared on the flight home. What exactly is Brownie Brittle? It is exactly what it sounds like. They are small crispy, crunchy brownie pieces that come in four amazing flavors: Salted Caramel, Mint Chocolate Chip, Chocolate Chip, and Toffee Crunch. One thing I love about this business is that it came from a family recipe. 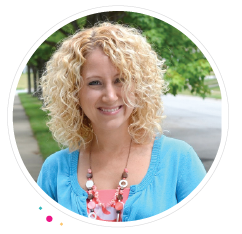 Sheila G. started her own brownie business selling a family brownie recipe to restaurants and theme parks. She had a particular fondness for the crispy outer edges of the brownies though, and one day decided to try making an entire pan of crispy edges. Her desire to create a fun new treat blossomed into the Brownie Brittle company today. I think it is great when someone has a dream, and they are able to make it come true. I am so excited to share this easy no bake treat with you today using Brownie Brittle. Salted caramel, chocolate, crispy Brownie Brittle…do I have your attention yet? 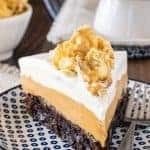 Did I mention it is a no bake recipe? You can be chowing down on this in about 15 minutes if you get started now. Normally I make a large batch of muddy buddies because my kids and I can’t seem to stop eating it once we start. But today I wanted to show you how to make this treat using just one bag of Brownie Brittle. Although once you start eating it, I think you will be running to the store for a few more bags. Muddy buddies, or puppy chow depending on where you live, is very easy to make. Crush a bag of Brownie Brittle using a food processor. Or you can use a plastic bag and a mallet or a rolling pin. Just make sure all the Brownie Brittle chunks are in fine crumbs. Stir melted chocolate over the cereal in a large bowl. When everything is coated, spoon the cereal into a big Ziplock bag and pour the crushed Brownie Brittle on top. Close the bag and shake those crumbs all over the cereal pieces. Now add a little bit of powdered sugar while the mixture is still warm. Shake it again and then pour onto a lined tray. Cut the caramel candies while you wait for the muddy buddies to set up completely. Sprinkle the candies throughout it, and then prepare to go to snack heaven. My daughter took a bag of this snack mix to school in her lunch box. All her friends that tried it have been asking for more! 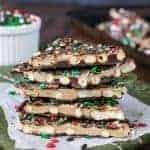 The other day when I was working on this post, my daughter came into our office and saw the pictures for this Salted Caramel Brownie Brittle Muddy Buddies on our computer. Her eyes lit up and she started talking about how good this snack mix was and when could we make another batch. Like I said, stock up on a few bags when you find the Brownie Brittle in your stores. I see a whole lot of different flavored muddy buddies in our future lunch boxes! 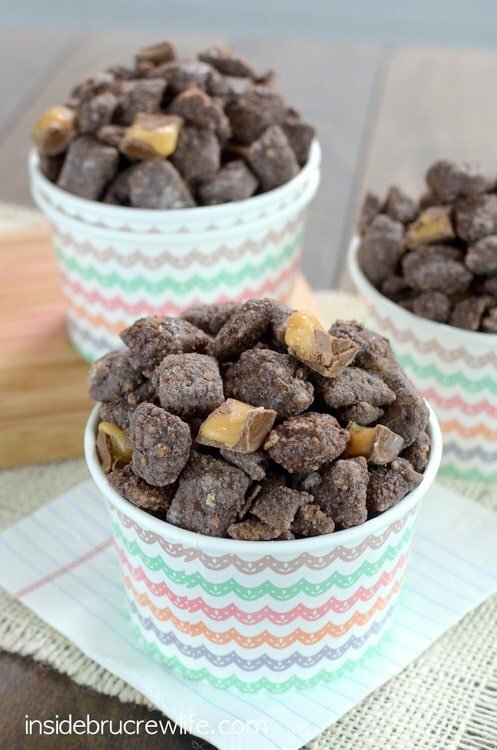 Crushed Brownie Brittle and caramel candies make this an irresistible snack mix. Perfect for packing in lunch boxes or snacking on any time of day. Use a food processor and crush the bag of Brownie Brittle into fine crumbs. Makes about 1 cup. Set aside. Melt the CandiQuik in the microwave according to the package directions. Pour over the cereal in a large bowl. Stir until all the cereal is coated. Spoon the chocolate covered cereal into a large ziplock bag. 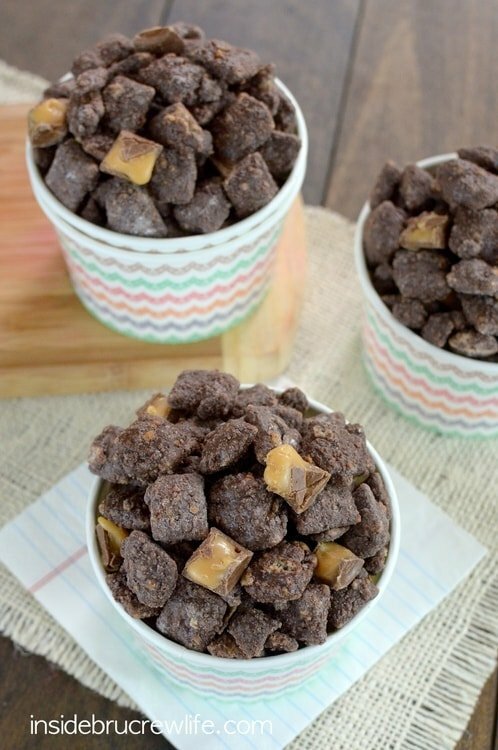 Pour in the crushed Brownie Brittle, close the bag, and shake the bag until all the cereal is coated in crumbs. Add the powdered sugar and shake again. Pour the cereal onto a wax paper lined tray. Let set completely. Stir in the chopped Rolos. Store in a sealed container. Makes about 5 cups of snack mix. *This post has been sponsored by Brownie Brittle. All opinions are 100% my own. That looks so delicious! I wish I’d be able to buy those over here, yum! Totally irresistible! 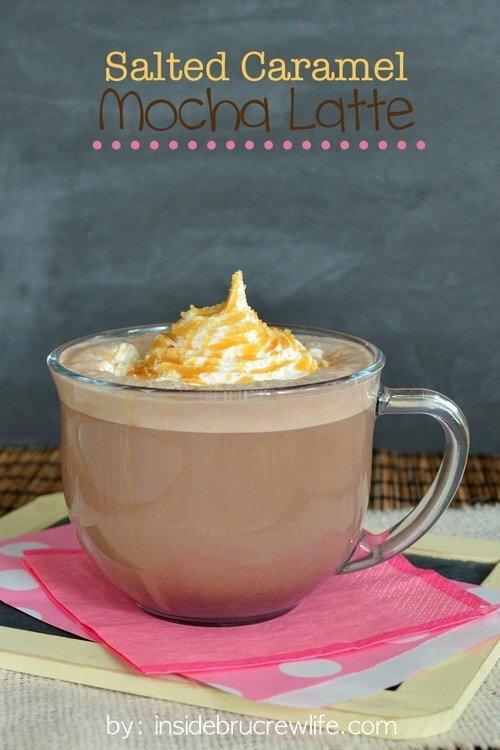 I need to make these now! You had me at Brownie Brittle, Jocelyn! I’m addicted to that stuff! It is so delicious, so I can only imagine how tasty this muddy buddy snack is. Can’t wait to try it out! Pinned! Aw yeah! I love Brownie Brittle, and this is the most amazing way to use it! I would definitely have to hide this stuff and eat it in the corner of my coat closet. You’re seriously killing me with this! I love brownie brittle and salted caramel, so I highly doubt I could walk away from this. Although I’d love every bite! Oh my this looks insane!!! That salted caramel brownie brittle is amazing. Genius idea to make muddy buddies. I actually just bought Brownie Brittle at the airport this weekend for a long flight. I was trying to think of a way to use it in a recipe! THIS LOOKS SO GOOD! Can’t wait to try it! So much delicious,l irresistible caramel. My mouth can only hold so much! 😉 LOVE this! This would be WAY too dangerous to have in my kitchen! 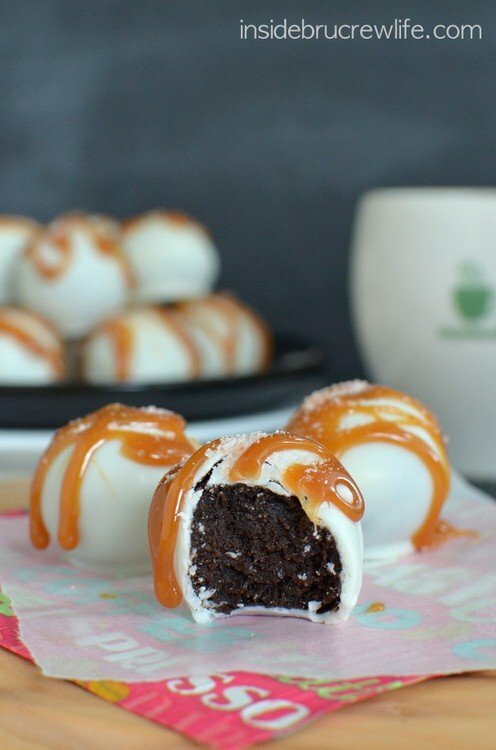 I’m a sucker for anything chocolate and caramel…and this looks crazy good! YUM!! These sound incredible. loving all the chocolate! 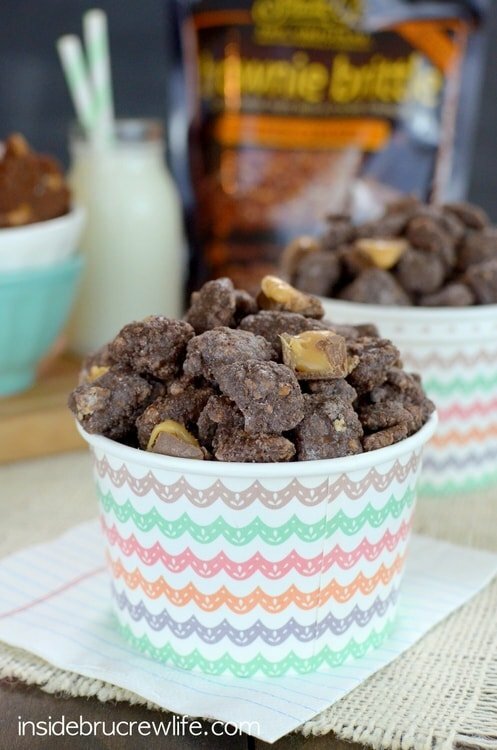 what a fun way to use Brownie Brittle!! Sounds awesome! Consequently mouth watering! That appears impressive. That sounds delicious! 🙂 Thanks Johlene! I saw Brownie Brittle at Costo a few weeks ago! I love that it’s a family business! so cute! I’m loving this version of muddy buddies! 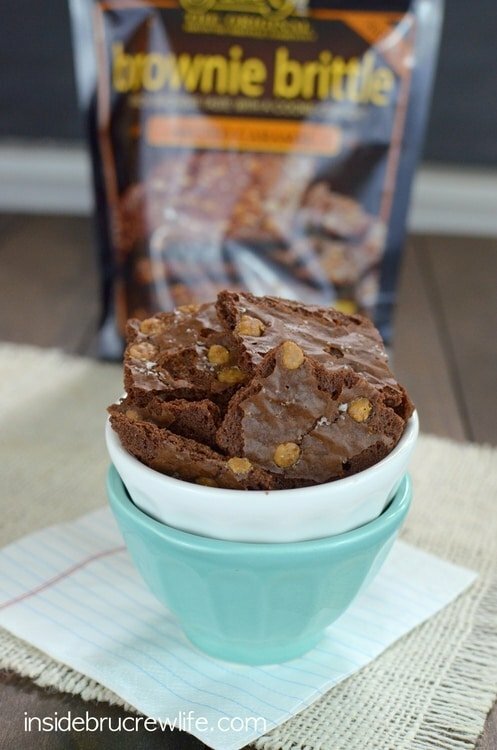 I need to add Brownie Brittle to my shopping list because it sounds heavenly… Thanks for sharing the story of the owner; makes me want to buy it even more! This snack mix is genius! I kind of want to be a kid again just so I can show up at school with a bag of this delicious mix. Yum! This looks incredible! And addictive! These look easy enough for my sons to make! I haven’t tried brownie brittle yet but it sounds awesome! And these muddy buddies look totally irresistible. Oh man, I have GOT to get my hands on that stuff – yum!! 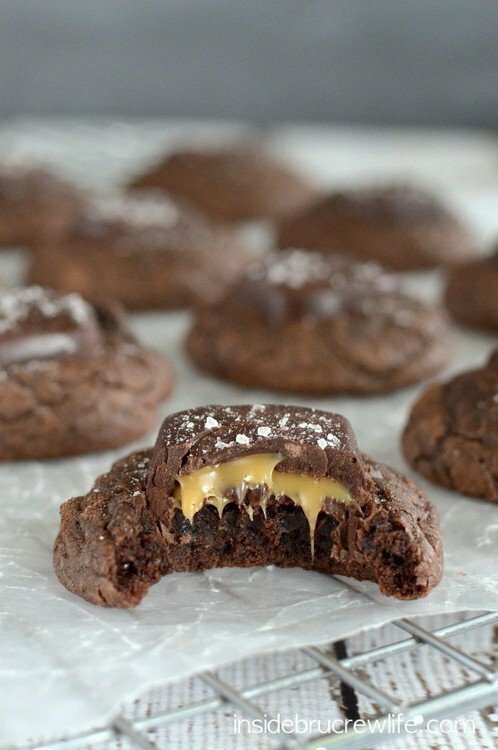 loving the look of these brownie bites.. wish i had a bowlful right now! definitely need to make the recipe, looks so chocolatey and delicious! Muddy Buddies are my favorite and I love this version! Brownie Brittle is so addicting… it never stays around our house long enough for me to do anything with other than eat! Oh, I just saw this Brownie Brittle at Costco and almost bought some. Now I definitely have to go back and get a bag! Yes, you do!! 🙂 It’s amazing! This is brilliant, my friend! I know exactly what I’ll be making next time I have brownie brittle in the house. Thanks! Girl, this is dangerous! 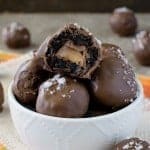 I know how addictive that Brownie Brittle is, but I think you just took it to an all new level with this Muddy Buddy mix! YUM! I could snack on this all day long! So delicious! This won’t last long in our house. 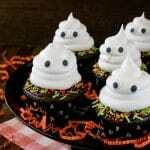 Can’t wait to make it next week as a special after school snack! Oh my gosh Jocelyn. You made brownie brittle AND muddy buddies better. I heart you! Oh good lordy. Best mash-up snack ever. 5 cups all in my belly! Oh yes! It’s recipes like this that make me appreciate the stretchy waistband. DANNNNG this looks so good! Glad to hear I was not the only one munching on Brownie Brittle on my flight back from Miami. 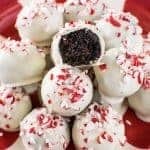 They are addictive and these muddy buddies sounds so good!! ummm can you send me your extras? Because I need these in my life! 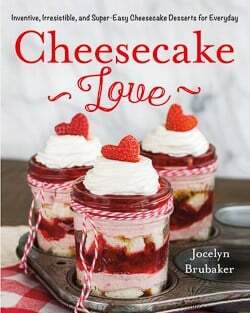 Great recipe Jocelyn! What extras??!!! Haha! 😉 Thanks Katrina! Ok, first of all, that Brownie Brittle is addictive on its own. Combine it in this recipe? I wouldn’t be able to keep my hands out of it!! Just a quick note to let you know that we made this on the weekend, my family loved it.